This is a traditional Swazi recipe for a spiced meat meatloaf that's finished by baking it under a spiced custard. While S made the Malva Pudding for dessert, D, R, and D made the main dish for our feast from Swaziland. Add in the meat and cook until completely browned. Season with spices and stir in the ketchup and jam. Spoon the mixture into a well-greased, oven-proof dish. Then combine the eggs with the milk and herbs and beat well. Pour the mixture over the babotie. Cover and bake for an hour, or until the custard has set. Remove the cover and bake for an additional 10 minutes, until golden brown. Let cool for 5 to 10 minutes in the pan before slicing and serving. Tonight, to go along with our tabletop travel to Swaziland, S made a Malva Pudding while I made the caramel sauce. Ah. Mazing. Malva pudding is a sweet pudding that contains apricot jam and has a spongy caramelized texture. A cream sauce - or a caramel sauce - is poured over it while it is still hot; we went for the caramel. Line a baking dish with parchment paper and butter generously. 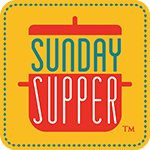 Preheat oven to 350 degrees F. In a medium mixing bowl, combine sugar and eggs. Beat until thick and lemon-colored. Mix in the apricot jam and beat again. In another bowl, blend together the flour, baking soda and salt. In a smaller bowl, combine the milk, vinegar and butter. Pour the milk mixture and flour mixture into eggs and sugar. Beat well until combined thoroughly. Pour batter into prepared pan. Cover with foil and bake for 45-50 minutes. The pudding will be dark brown and firm to the touch. While the pudding bakes, make the sauce. In a flat-bottom pan, melt butter over medium heat. Mix in sugar and cook until it begins to bubble and turn a darker brown. Remove from heat and stir in vanilla. Be careful...it will bubble up violently. Pour in the cream and cook to let it form a caramel. Let cool for 10 minutes before serving. Cut pudding into slices and pour caramel sauce over the top. We went on a hunt for wildflowers yesterday. According to one of the park docents, we missed it by about three weeks. Instead of hills draped in a carpet of orange poppies, we had charred blossoms; they weren't just wilted, they were positively singed. Look at my crew of unhappy hikers. They felt duped, as did I. I had promised them wildflowers. Boo. We stopped at the store on the way home from the park and I spotted this bottle of wine. It had poppies on the label and it was from Antelope Valley. I know the kiddos couldn't - and wouldn't - enjoy it. But Jake and I joked that we found poppies! And though I readily admit that I bought this bottle for the label, it was perfect with dinner after a day in the desert. Tasting Notes: Garnet color with rose, plum, and vanilla aromas. On the palate it's medium-bodied, elegant with great texture and mild acidity with a lingering sweet finish. Lighter than I expected from a zinfndel. Easy drinking wine. I paired it with Ostrich Lasagna, green salad, and roasted beets. Yesterday we visited an ostrich farm and fed some of the animals. I had warned the kiddos that it was a farm and we might purchase eggs and, possibly, meat. The guy manning the store didn't have the meat there, but told me where - in town - I could find it. So, today, we tracked some down. The kids had voted for the steaks, but all the store had was ground ostrich meat. I had been planning on making lasagna anyway, so I decided to make ostrich lasagna. I'm certain that the flavor is masked by the herbs and the wine, so we'll have to try again another time. In a large, flat-bottom pan, saute the onions and fennel in a splash of olive oil until softened and translucent. Add in the ground ostrich meat and 2 T butter; friends had warned me that ostrich was lean and needed added fat. Cook till browned through completely. Add in the tomato sauce, wine, and water. Bring to a boil. 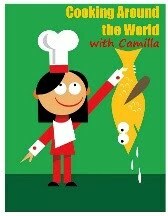 Reduce the heat to a simmer, stir in herbs, then season to taste with salt and pepper. Preheat oven to 375 degrees F. To assemble the lasagna, layer meat sauce, noodles, shredded cheese blend , cottage cheese, and meat sauce. Repeat till your pan is full though the last layer should be meat so that the noodles are completely covered. On a side note...we just realized that the table does actually have six chairs. And we found the leaf for the table in the girls' closet. So, tonight, we ate all together instead of in two shifts. Great conversation with lots of giggles. 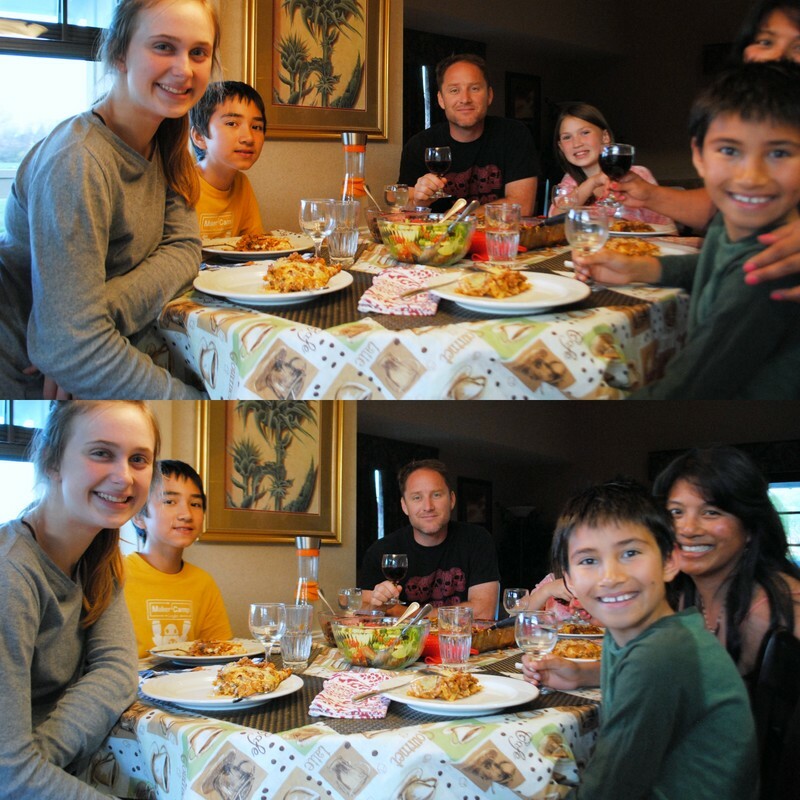 Now I just need to figure out how to get all of us in the shot...and in focus. Goedangan is a cool and refreshing salad that's similar to Indonesian gado-gado. It's made with blanched vegetables in a coconut-based dressing. Whisk together the coconut cream and yogurt. Stir in the sugar, cilantro, lemon juice, and salt. Chill until ready to serve. Slice the cabbage into thin strips and trim the ends off the green beans. In batches, blanch the cabbage, green beans, and mung bean sprouts. Drain and plunge them into a batch of ice water. Let stand for 5 minutes. then drain. Place the vegtables in a large mixing bowl. Spoon dressing over the top and toss to coat. Arrange vegetables on a platter and top with wedges of egg. Sprinkle with paprika for garnish. Serve immediately. Bojo is a flourless cake made, traditionally, from grated coconut and cassava. Cassava is a starchy root plant also known as yucca. It's also, traditionally, made with rum-soaked rasins. I completely failed on multiple counts in bringing the ingredients for this dessert. I forgot the cassava in my freezer at home; so we used potatoes instead. And I intended to just use raisins - without the rum - but I left those at home, too. So, we did without raisins, too. It was dense and delicious...but is not your traditional Bojo. Preheat the oven to 325 degrees F. Butter a 9-inch round cake pan and line bottom of pan with parchment paper. Stir the coconut and grated potatoe together with the sugar in a large mixing bowl. In a small bowl, whisk together the eggs, coconut milk, vanilla, almond extract, and salt. Stir the wet ingredients into the coconut mixture. Pour in the melted butter. Pour the batter into the prepared pan. Bake until golden brown on top, approximately one hour. While the cake is still warm, run a knife around the edge of the pan. Then let cool in the pan. Slice into wedges and serve. Remember when I made briquettes? Well, I couldn't let that failure stand. So, the day after I completely failed at creating those dreamy, buttery, flaky morsels, I went back into the kitchen and gave it another try. This time - success! Combine the water and yeast in a large mixing bowl. Let stand for 15 minutes for the yeast to bloom. Add 2 1/2 C of the flour, keeping 1/4 C for later, and the salt. Stir with a wooden spoon until a shaggy dough forms. Cover the mixing bowl and let the dough rise until doubled in size, approximately one hour. Once the dough has doubled, place it in the fridge to chill for at least an hour or as long as overnight. Pound the butter into rectangle. Some people use a ruler and make it very precise. I am less-precise. Wrap the butter in parchment and chill with the dough. When you're ready, sprinkle a piece of parchment paper with flour and place dough on top. 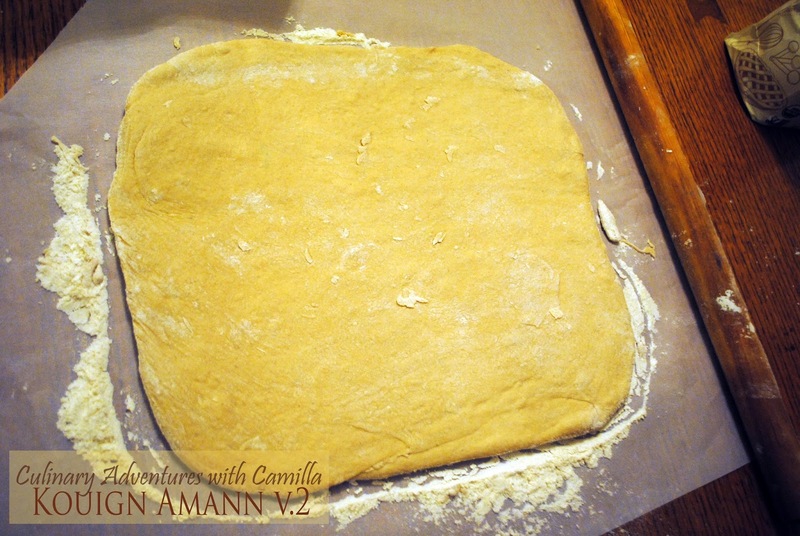 Roll the dough into a rectangle roughly 12"x 20". Remember, I'm less than precise, but it was around that size. Remove the butter from the fridge and lay it in the middle of the dough. 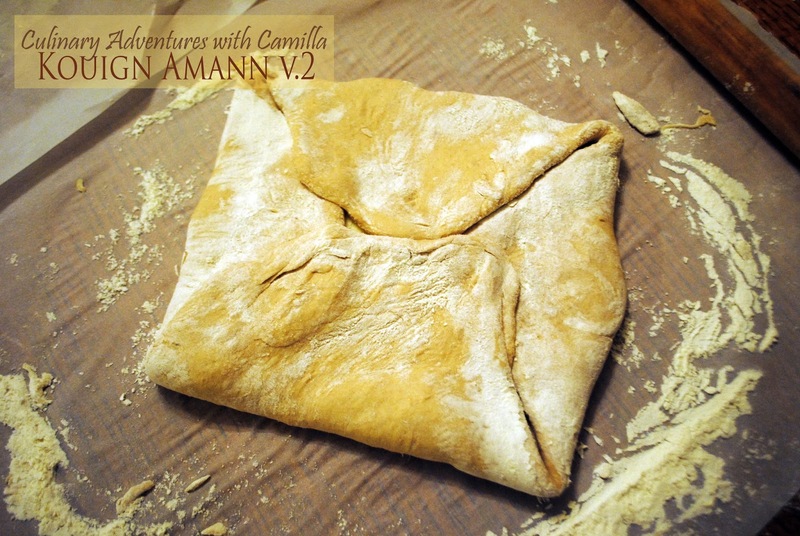 Fold the corners of the dough in to form an envelope. Using the rolling pin, roll it out to 12"20" again. This time, fold one third of the dough over the other third, like folding a letter. Now you have to turn the dough. This process was new to me. 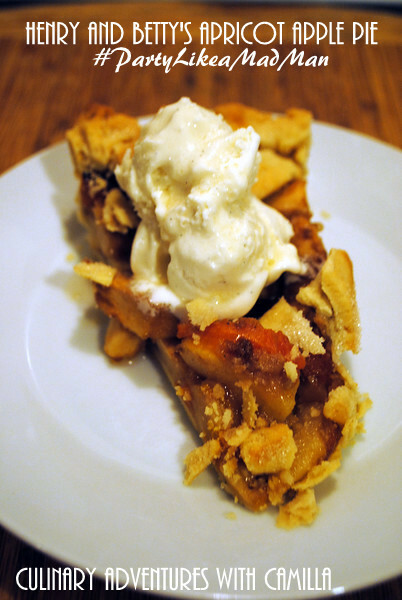 Turning the dough, by rolling and folding, creates very thin layers of butter and dough. This recipe needs to be turned 4 times: 2 turns now, and then the final 2 turns after you chill the dough. If the butter pushes through a layer of dough, rub it with a little flour. If the butter seems to be melting, chill the dough for 30 minutes between each turn. Keep the parchment, the rolling pin, and the surface of the pastry well-floured. To turn: Rotate the package of dough and butter so that the narrower, open end is facing you, like the pages of a book. Roll the dough out to a rectangle and fold the top third down and the bottom third up, again like a letter. Rotate the dough 90 degrees so that the open end is again facing you. Repeat. 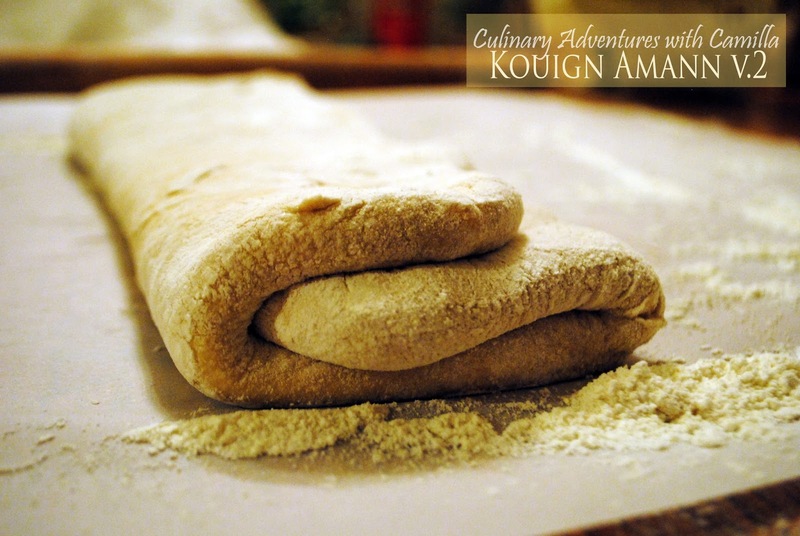 Roll the dough out to a rectangle and fold the top third down and the bottom third up. That's 2 turns. Transfer the dough to a parchment-lined baking sheet, cover with plastic wrap, and refrigerate 30 minutes. Do not refrigerate much longer than 30 minutes or the butter will break when you roll it out. Remove the dough from the fridge and transfer it to a well-floured parchment. With the open end facing you, roll the dough out to a rectangle, again. Fold the top third down and the bottom third up. Rotate the dough 90 degrees and repeat. That's 4 turns. Transfer the dough to a parchment-lined baking sheet, cover with plastic wrap, and refrigerate 30 minutes. Rub the insides of a muffin tins with butter. Set aside. Remove the dough from the fridge and transfer it to a parchment-lined baking sheet. 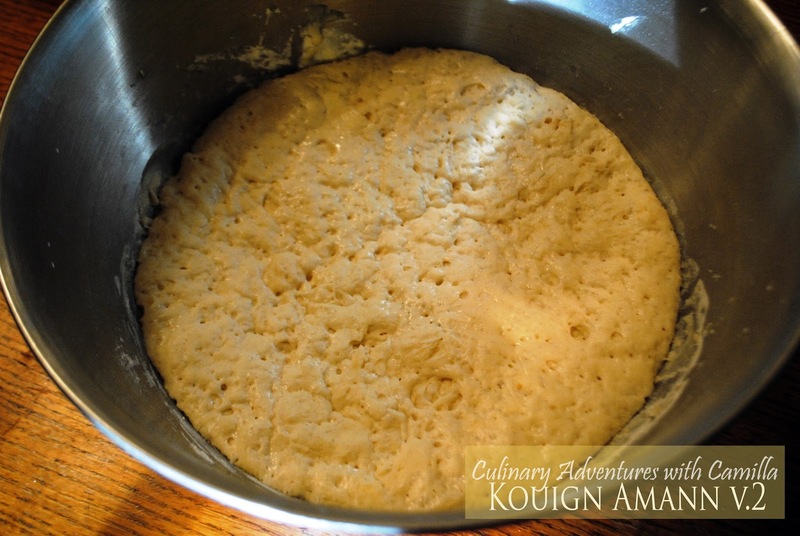 Roll the dough out to approximately 1/4" thick. Sprinkle 1 C of sugar and ground cardamom over the top of the dough. Slice the dough into twelve squares. Pull the corners of each square toward the center. Transfer the dough to the prepared muffin tin. Sprinkle the remaining sugar over the tops of the pastries. 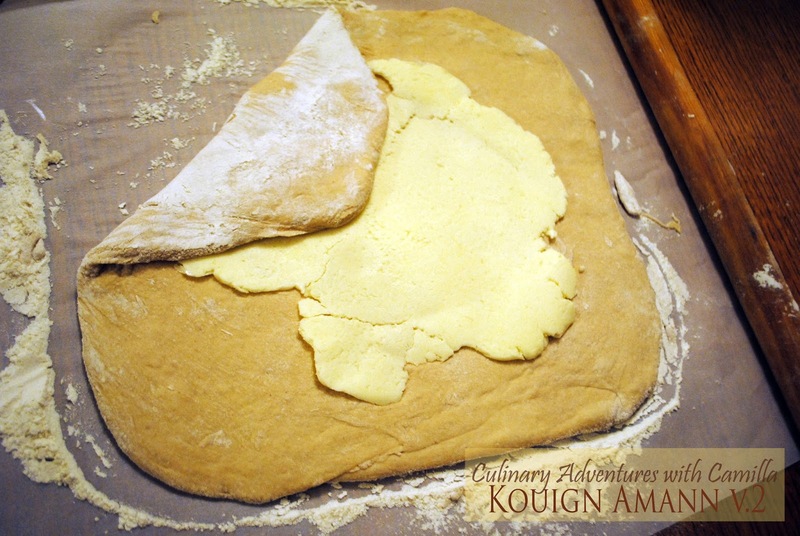 Cover the kouign amann loosely and let rise until slightly puffy, approximately 30 to 40 minutes. Preheat the oven to 400°F about half-way through the rise. 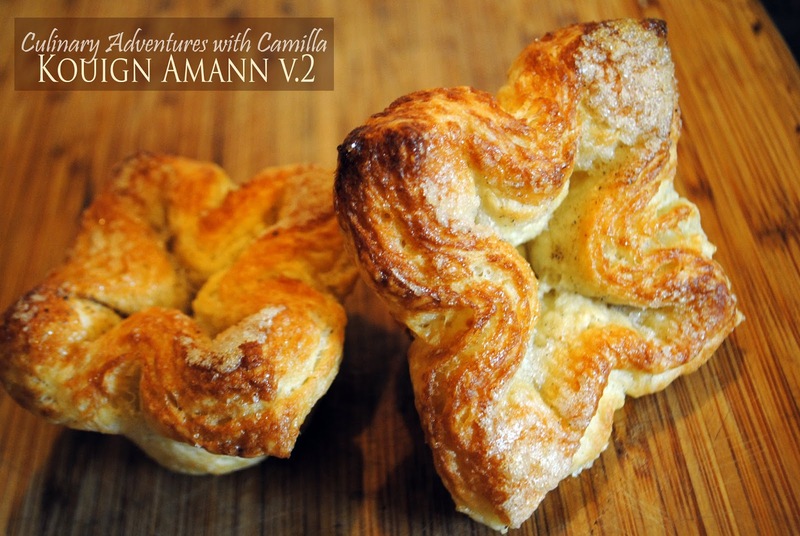 Place the kouign amann in the oven and immediately turn the heat down to 350°F. Bake for 40 to 45 minutes. Pastries are finished when the tops are deep golden and the tips look as if they might be just starting to burn. Let cool for 5 to 10 minutes in the baking dish but be sure remove them after that. If they cool completely in the baking dish, they will be impossible to remove. Gently wiggle them out of the tray, then transfer the kouign amann to a wire rack to finish cooling completely. Best served the day they are baked. 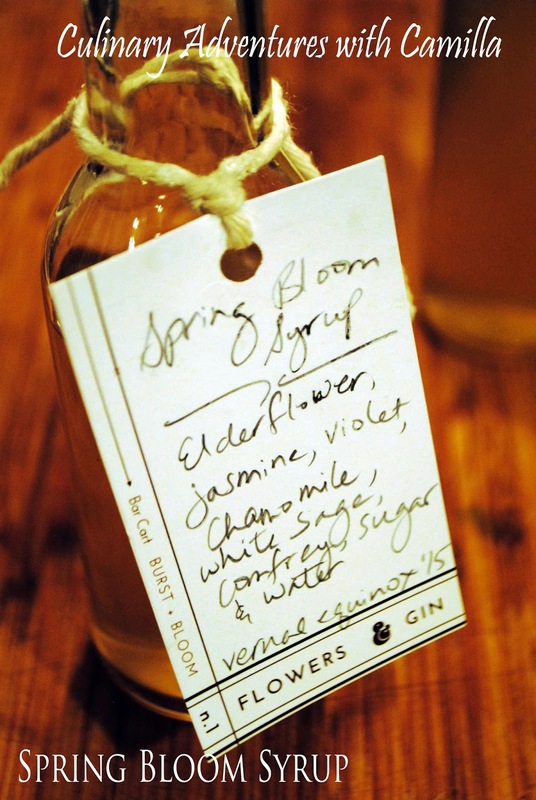 Last week I went to #FlowersandGin - and I still do need to post about that class - where we infused booze and a cold-process simple syrup with foraged, seasonal deliciousness. 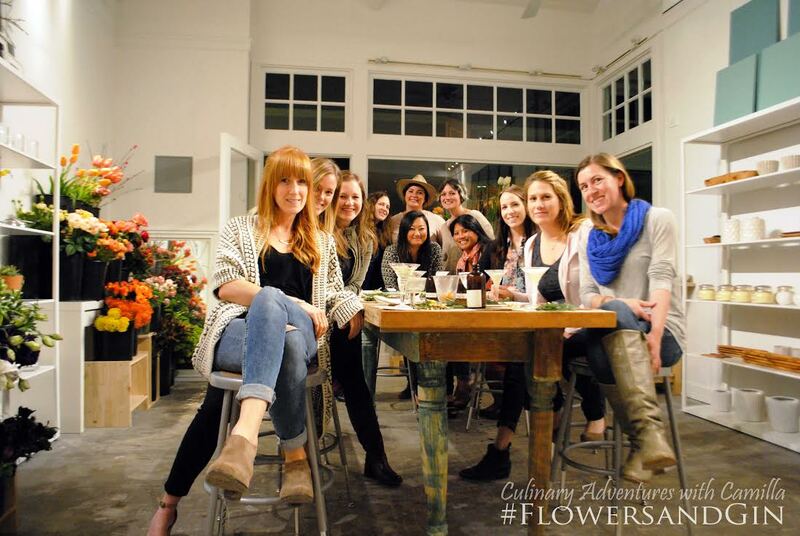 It was a lovely evening with some lovely gals. Thanks, Katie and Lolo! I received an email reminder last night to check my syrup. So, this morning, I gave it a taste and was happy with the level of flavor. I strained out the blossoms and transferred the syrup into two small bottles. Place sugar in a mason jar. Place your blossoms on top of the sugar. 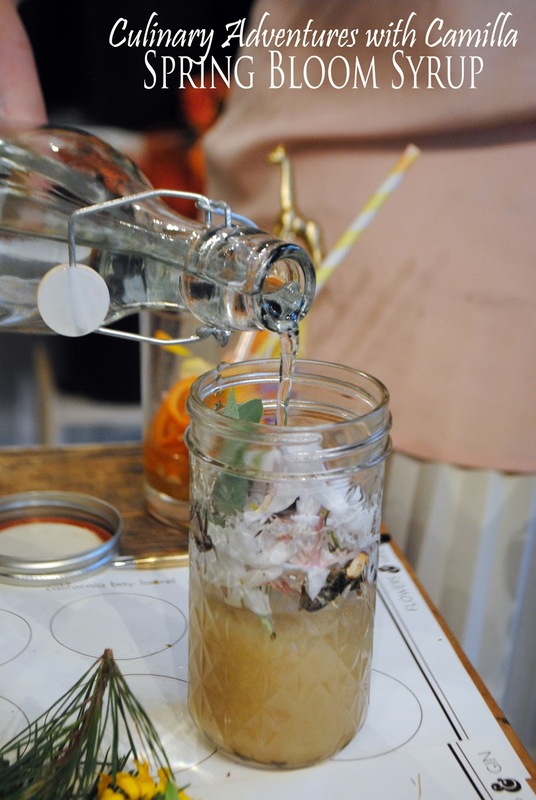 Fill the jar with cool water. 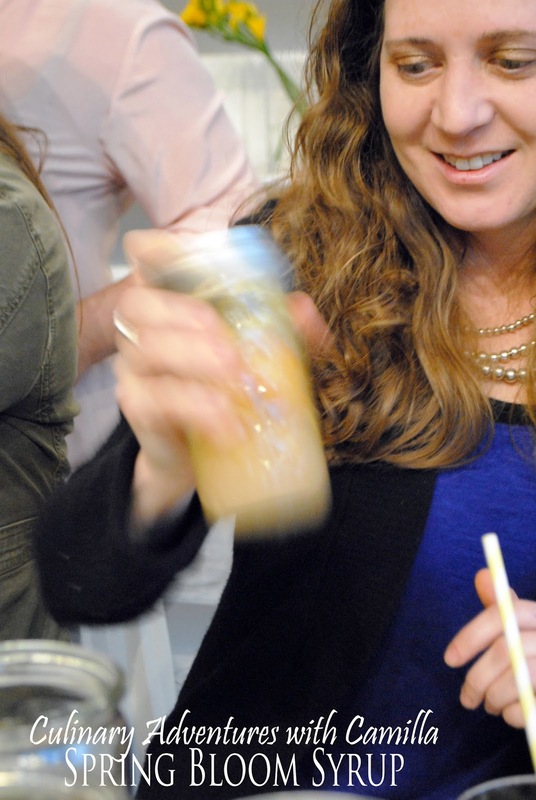 Tighten the lid onto the jar and shake. Shake. Shake. Shake. And, then, shake some more. Shake till the sugar is completely dissolved and the blossoms are bruised. 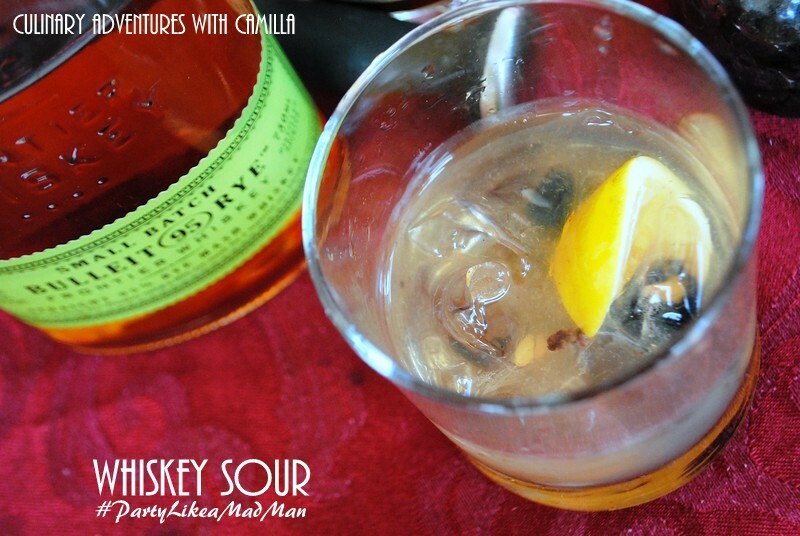 Let stand for up to a week - really it's for as long or as short as your palate desires. Mine was infusing for six days. Pour the syrup through a strainer to remove the blooms. Then pour into small bottles. 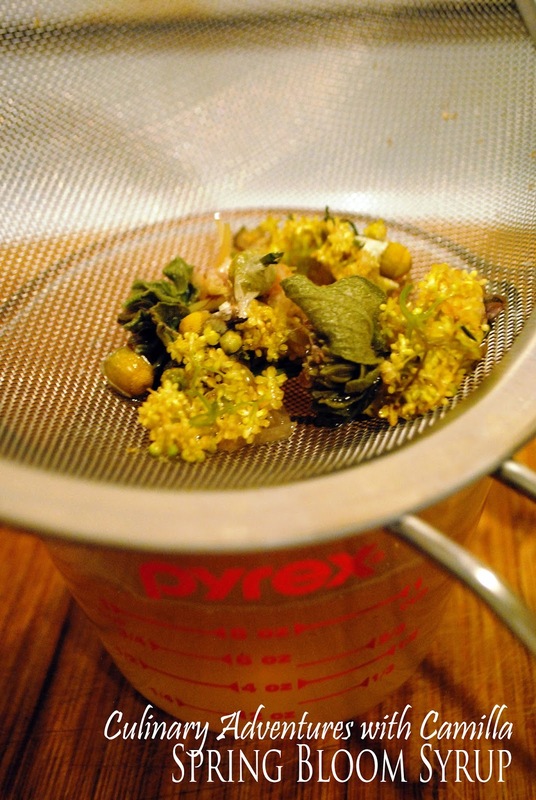 Interesting note: when I smelled the syrup the evening I made it, the chamomile was overpowering. 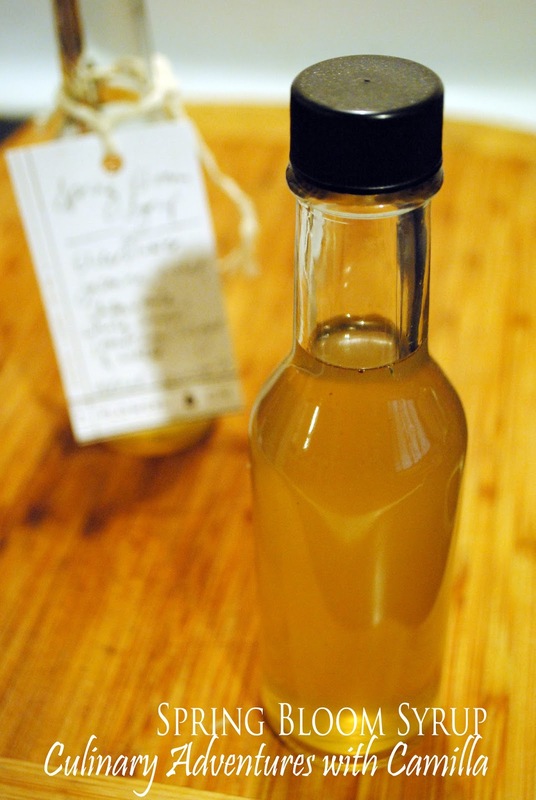 Over the course of six days, the scents and flavors mellowed out and I now have a mild, floral syrup. No single flower stands out. I love it! Now I'm ready to play. Any suggestions as to what I should make?? I'm all ears. Fifteen years ago, Jake and I celebrated our wedding with a beautiful, sun-kissed afternoon on the upper patio at Tarpy's Roadhouse. Funny story: when we told my parents that's where we had chosen for the reception, my mom pitched a fit. "Why are we having your reception at a roadhouse? What does that mean anyway? Roadhouse. That doesn't sound appetizing at all!" she objected. It's just a name, Mom. I assure you there are no animals or carriages there anymore. And it's close to the church. 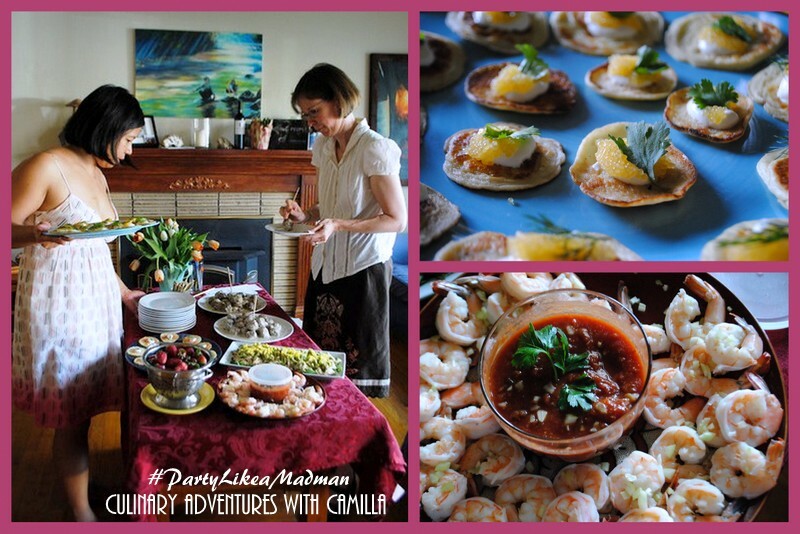 She assented and we have a lovely lunch surrounded by friends and family. The meal was served in the library and on the patio. 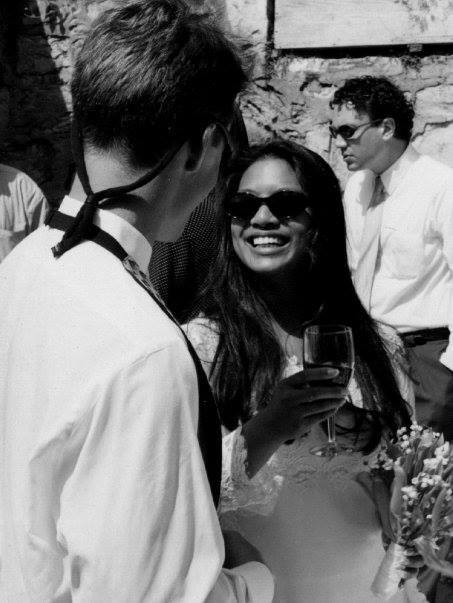 Then we danced and sipped the afternoon away and - yes, it's true - I won the limbo contest in my wedding dress. So, when my parents offered to keep the boys overnight for our anniversary, I dug out a gift certificate that a friend had given us during the holidays. I heard that Tarpy's had rolled out a new menu and I figured it was a fitting evening to try it. We haven't eaten there in years. I think the last time we ate there together was the day I found out I was pregnant with D. Yes, it's been that long. I've eaten there for work meetings and for girls' nights, but I hadn't been there with Jake in over a decade. 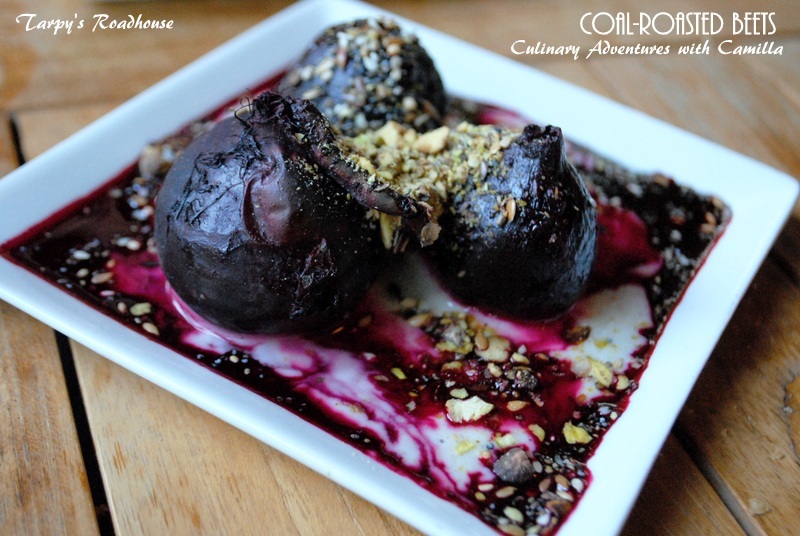 Coal-roasted beets. These magenta lovelies were swimming in a pool of cumin-scented yogurt and sprinkled with Pistachio Dukkah. The beets were perfectly done. 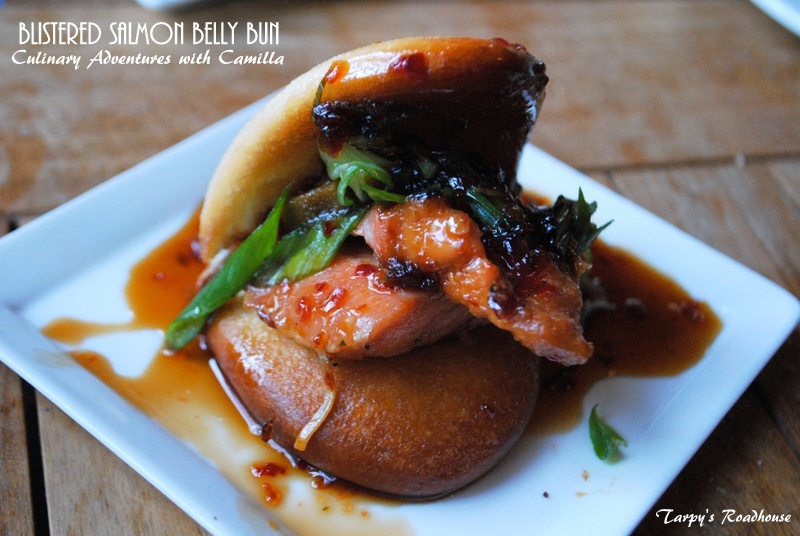 Blistered Salmon Belly Bun. If there's salmon belly on the menu, I'll order it. No matter what. I should have skipped our entree and ordered two more of these! It's served with charred okra, scallions, sambal and honey. Nicely done. And though I didn't take photos of them, our veggie sides were tasty, too. We ordered Bacon Braised Chard and Roasted Cauliflower and Brussels Sprout Leaves with Bourbon Syrup. The two larger items we ordered - the salad and the main dish - were just okay. They were interesting combinations of flavors, in theory, but execution was slightly off in my opinion. So, I'm glad we tried out the new menu...I'm just really glad I had a gift certificate to cover it. My husband Jake and I are celebrating 15 years of marriage today. Fifteen years. On one hand that feels like a lifetime; on the other, it seems to have passed in the blink of an eye. In this past decade and a half, we've had two kids, lived in two states and five different houses, and juggled probably about dozen different jobs between us. 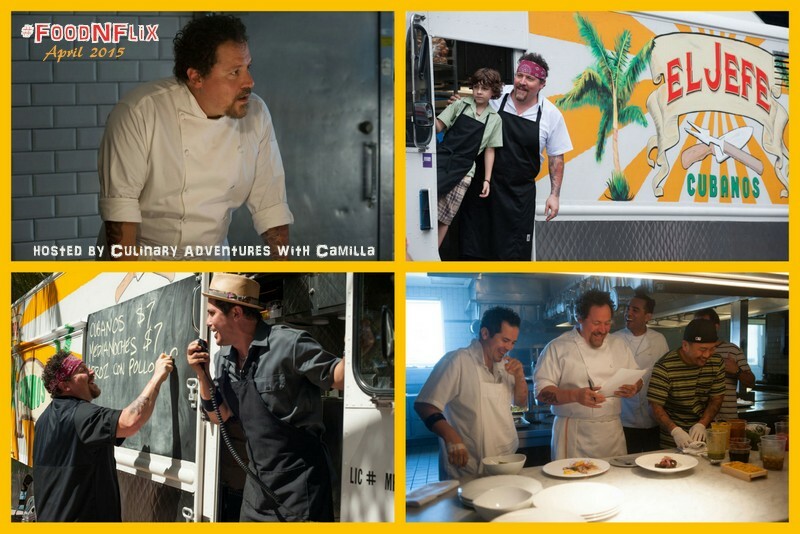 We've been to Oregon, Washington, Alaska, Florida, Texas, New Mexico, and Arizona; we've traveled to Italy and Costa Rica. We've SCUBA'd, zip-lined, canoed, and tangoed. It's been an amazing adventure. But it's also been work. Don't let anyone tell you that marriage is easy. 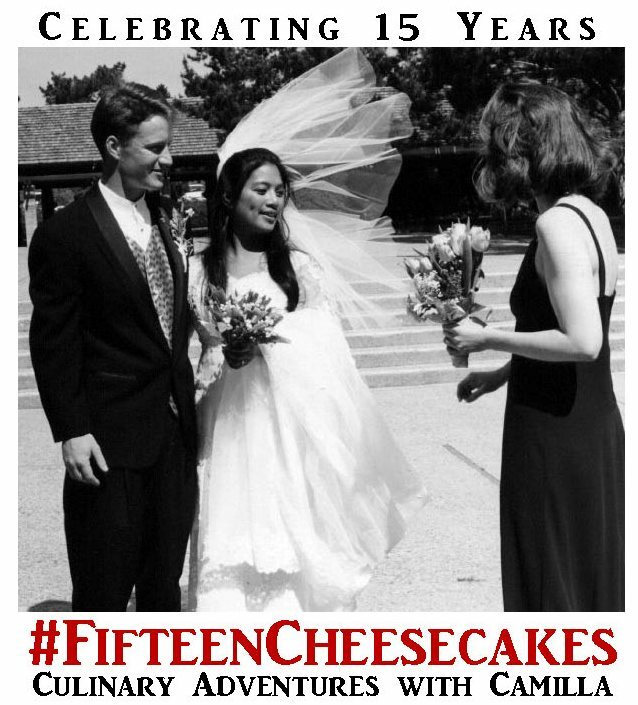 So, today, as we celebrate fifteen years, I have an amazing crew of foodie bloggers lined up to share cheesecake recipes with you. 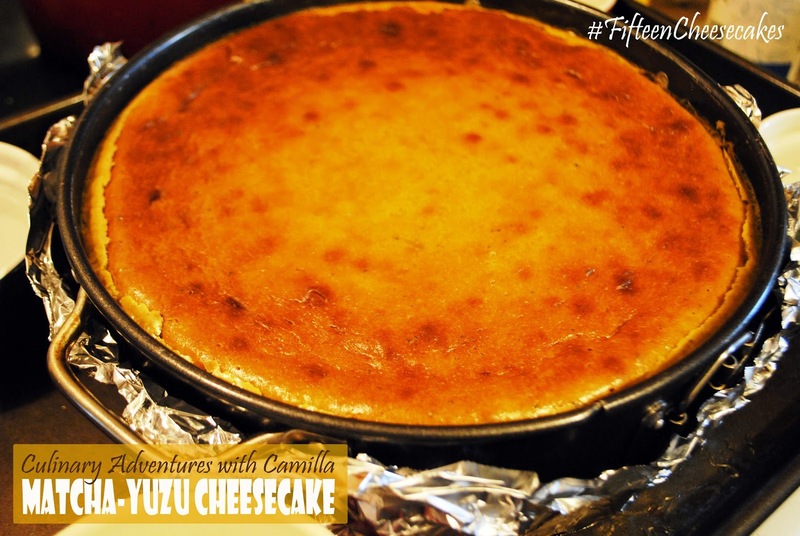 Initially I put out a call for fifteen cheesecakes - hence the hashtag #FifteenCheesecakes - but the spots filled up within an hour and I had more friends who wanted to participate. So, I figured: you can never have enough cheesecakes, right?!? We had seven cheesecakes at our wedding instead of a traditional wedding cake. So, maybe more than fifteen cheesecakes made sense here. I removed the cap on the event and off we went. Here's what everyone else brought to the cheesecake table...listed in alphabetical order. 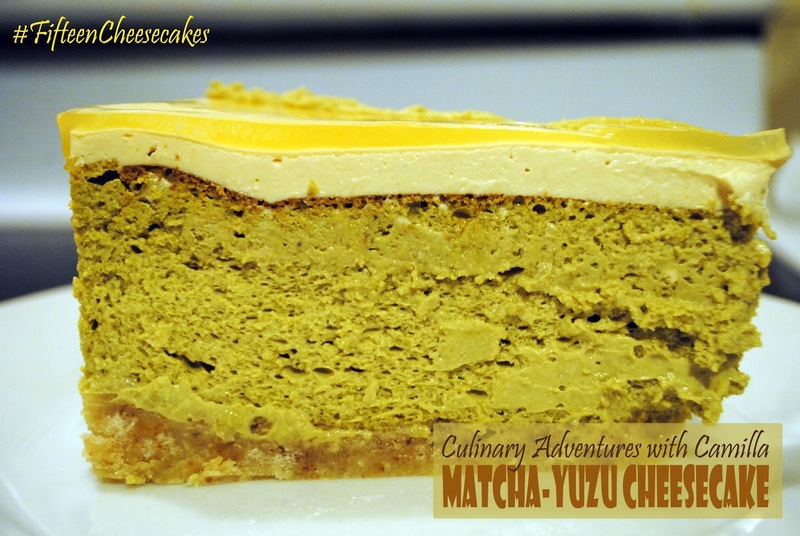 And though I was really tempted to make a savory cheesecake for the occasion, I ended up going sweet with a matcha cheesecake spiked with yuzu liqueur and glazed with a Meyer lemon gelée. Thanks to Shiho for the bottle of yuzu booze. You know what I like! Mix all of the ingredients together until moist clumps form. Press crumb mixture into the bottom of a springform pan that's been wrapped in foil. Chill crust while preparing filling. Position rack in center of oven and preheat to 350°F. Beat cream cheese in large mixing bowl until fluffy. Beat in sugar. Beat in eggs - one at a time. 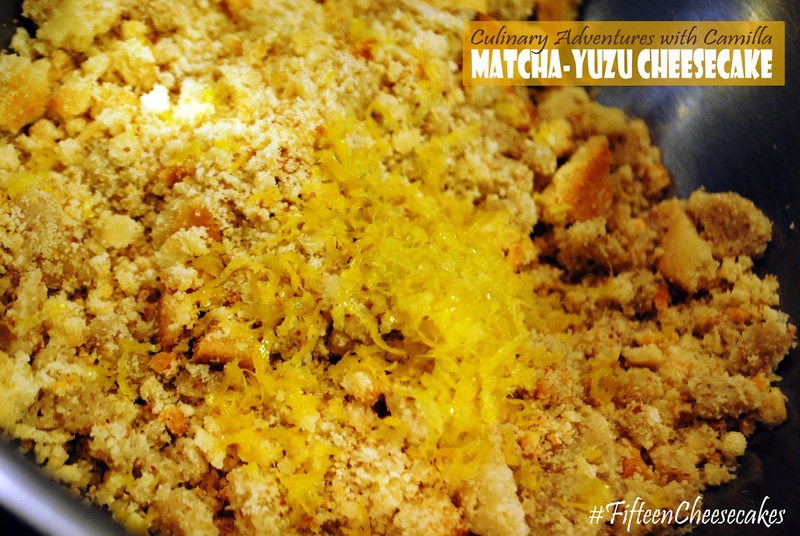 Finally, mix in sour cream, yuzu liqueur, matcha green tea powder, and lemon zest. Spoon filling into prepared crust. Beat the ingredients together. Spread over the cheese cake and bake in a 350°F oven for 5 minutes. Let cool for an hour and prepare the Meyer lemon gelée. In a small bowl, sprinkle gelatin over 4 tablespoons of the juice; let stand until soft, about 10 minutes. In a small saucepan, bring sugar and 8 tablespoons juice to a boil. Combine remaining juice and cornstarch in a small bowl. Stir until dissolved; then, whisk into boiling lemon juice. Remove from heat. Stir in softened gelatin. Cool to lukewarm, and spoon over cake. Let set. Run a butter knife around pan edge to loosen cake. Cool completely. Remove foil from pan sides. Chill some more. Remove pan sides to serve. Slice into wedges and serve.